This gig review is never going to be objective – I must confess I used to play in a band with Andy Oliveri in years past. Nevertheless, a review is still in order. 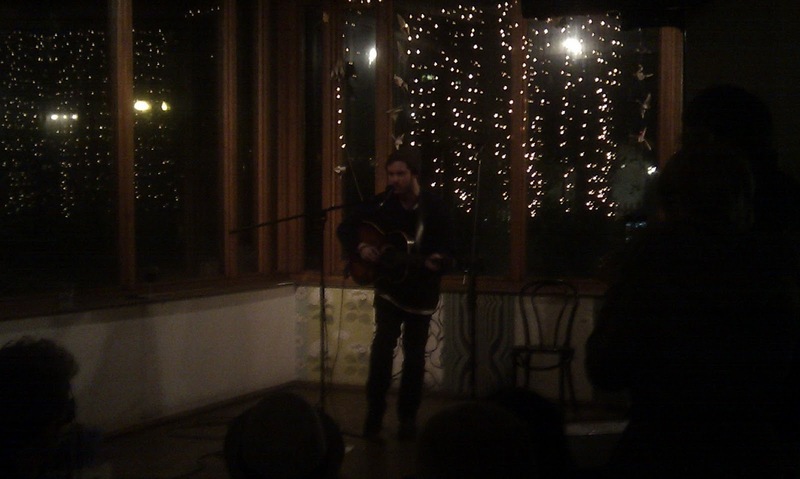 The venue – small, intimate, covered in fairylights, organic cider in bottles. A nice place to see some nice folk. First up – Drew Worthley. Mid-set chat was warm-hearted, light and he came across as a good guy. If only he’d managed to drag that across into his music. Whilst technically good, his performance felt wooden and his lyrics were cheesy than a budget Mills & Boon knock-off. The only way a solo singer-songwriter can rally the audience up is if share something of themselves. Unfortunately, with Drew it felt like he was projecting what he wanted to be, not who he was. He needs to get back to his roots – and play from the heart – not from a Clintons Valentines card. Oliver Chapman was closer to the bullseye. A young, talented guitarist with a distinctive voice and strong lyrics. The songs were stark and bare, but it suited the intimate venue and made the audience really sit up and listen. He brought a bassist on for a couple of tracks – again a very gifted player but unfortunately for me, it just didn’t sit in the mix. Electric bass should really only sit with drums. If Oliver didn’t want a kit on stage (only the most expressive and talented of drummers could have played without ruining the vibe) then he should have gone without the bass. And he should have signed up a cellist instead. It would suit his music, could have provided real lift to his tracks and would have added to the mix instead of breaking it. Andy came out and played a corker. His voice has come on in spades since I last saw him, and his guitar work was second to none. His mike technique was better than the previous performers, and you could visibly see the sound engineer relax as he realised he wouldn’t have to push the system so hard with this artist. The songs were great – you can tell he’s writing a lot at the moment. Some felt a little more fleshed out than others – I must admit I’m a bigger fan of Marigolds and Balance on a rope to My Father’s Son. But it didn’t matter – all were played with skill and emotion. His harmonica playing also didn’t fail to deliver – beautiful.